(pmck) Humulus is a trio from Bergamo in Italy. They are raw and heavy, but also atmospheric and chilled. Humulus loves and brews beer, enjoys touring and never stops playing. They are Giorgio on the bass, Massimiliano on the drums and Andrea on guitar and vox. I had a nice long talk to them before their set at this year’s FVF. Pearl: It is Thursday at the FVF and here with me I have Andrea, Max and Giorgio of Humulus. Hello you guys! Great to have you here! Pearl: So, every year Rockblog.Bluesspot sponsors a band to play at the FVF. And you are this year’s sponsored band! Please tell me how that all came to happen. Max: First we started working with Noisolution. Then they sent Kirsten a promo CD from the last album we released one year ago. Kirsten really enjoyed us, she also came to the festival we organize at home to see us play. She and Jens Heide organized everything else, actually. Now we are here, and are thankful to be so! Pearl: And I can’t wait to see you rock the stage in a few hours! So, tell me. You have three released albums, one EP and your own IPA beer, correct? Andrea: Yes. The first album was recorded in 2009 with another line up. Giorgio is the only original band member, actually. I myself joined the band back in 2015. The „Electric Walrus“ EP was the first project I worked on with these guys. Last year we released the „R.H.I.No.“ album, and we are truly happy with the results. This album actually got us playing everywhere. We love being on the road. Pearl: Could you tell me about the influence this line up changing had on your music? Andreas: It was quite a big influence and I think a good one. But I mean, line up changes always change the music. Because people are different and like different stuff. With us, I think it was also so impactating because we had a vocalist change. And the voice of a band is something quite characteristic, when you change it, you notice it. I am very different from the guy who used to play before me, and I do the best I can in my own way, though. Pearl: Since releasing „R.H.I.No.“ you have been playing a lot! Is this the second tour of this album already? Andrea: We never stopped playing since the release, actually. We don’t have the possibility to play really long tours because of day jobs and other band projects, so we toured Germany last year in November, are here now and will be on the road here again in October. 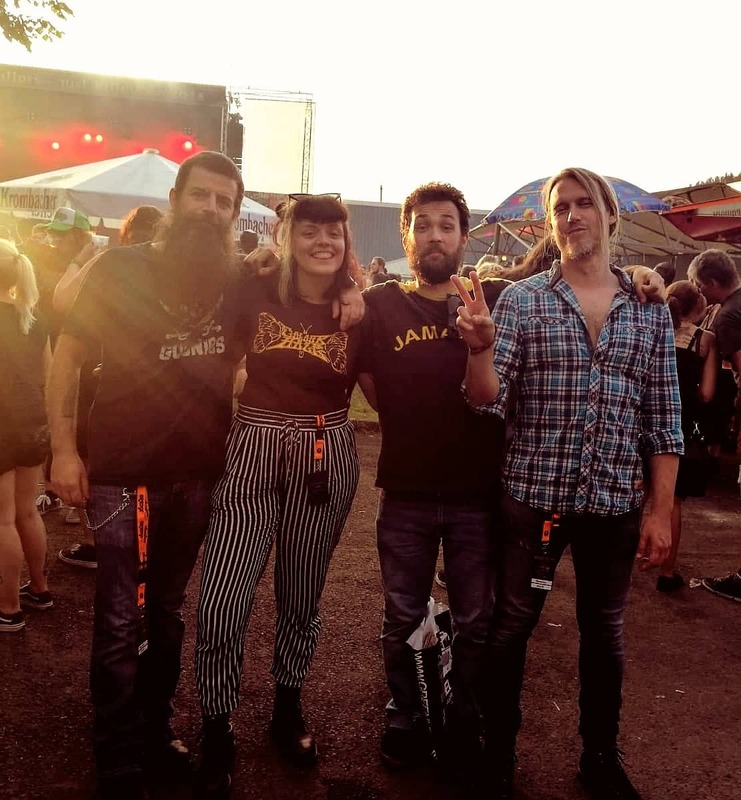 Max: Yes, in this small fall tour we are playing in Austria, the South of Germany, Berlin… We will play at the Keep It Low pre party with Naxatras, for example. Pearl: So, since you said you are all so different, I would like to know about your musical backgrounds. Let’s start with you, Andrea. Andrea: Well, I will definetly have to summarize that! As a listener, I like a lot of different things. But I think the music that most inspired me was everything that came out in the seventies. From maisntream rock to underground stuff. Apart from that I really like nineties alternative rock, like stoner and grunge. It was the music of my generation. I was growing up while it was growing up… so it also became a part of me. Max: As a listener, I also like a lot of different stuff. I like electronic music a lot, too. Drum n‘ Bass, etc. As a drummer, I take inspiration from the seventies on the one hand. On the other hand, I let myself be inspired by the music nowadays, too. The bands that play here at this festival for example, the underground rock scene we are celebrating here today. Giorgio: Well… I listen to Motörhead. Andrea: Well, I played in a lot of bands through the years… Everything from Garage to Hard Rock to Progressive Rock to Country music… Currently I am playing with my solo band. I play music for a living, so I have to play in some cover bands too. For the money, mostly. We can’t make a living with Humulus. I mean, maybe now that we played at the FVF we will only go up from here. But as things are now, to live from the band we would have to play crazy long tours or 300 gigs a year, and we are not up to that. Pearl: Ok, so Andrea is a full time musician… What do you guys do when you don’t have a bass or your drum sticks in your hand? Max: I am a butcher and a somelier. And I also play in another band, which is now taking a break. Giorgio: I do metal craft work. We are a small family company, maybe ten or twelve people… We produce peculiar stuff. It is a mixture between a factory and an atelier. Pearl: So, let’s talk about beer! Pearl: For those who don’t know, what I think is not that probable in Germany, Humulus Lupulus is hops, which beer is made of. And well, the band’s name is Humulus. What is that about? Are you just really big beer fans? Humulus: Actually, yes. We are just that big beer fans. It is that simple. But it sounds good, too. Giorgio: I used to brew beer in my garage, with my brother and some friends… And one day, I thought… why not Humulus? It is a simple name and sounds beautiful. Pearl: It is an awesome name. And well, you also produce beer as a band! You even have two kinds. IPA blonde and black. Giorgio: Yes. I have had the recipe for this black IPA for some time. It is the same I used to brew in my garage. Then I asked a friend of mine who owns a big craft brewery in Bergamo if we could work with him producing this black IPA with the band’s name and logo. After a year, we started brewing the blonde one. They are both very good. Max: The blonde one is called „Queens Of The Stone Ale“. Pearl: Awesome stuff, you guys. Where can I get some bottles of this beer? Do you always have beer as merch when you play somewhere? Max: Yes, on our merch table we actually have two barrels of each kind. People just have to come to a Humulus gig to try our beers out! Most people spend so much in the beer, that they don’t buy our records anymore, haha! Pearl: Let’s talk a little more about music, I really enjoy the last album. Your music evolved in such an amazing way. Can you tell me a little about the creative process of „R.H.I.No.“? How did the magic happen? Andrea: For me, it was all a totally new experience. Normally, I used to write the songs myself when playing in other bands. With Humulus, since I was invited to play with them, a pre existing project, I didn’t want to bring all and only my stuff for us to play. We jammed a lot for the last album. We had some bass riffs to lean on, Giorgio’s creations. But the rest around that we expanded together. Of course I wrote the lyrics. „Cat Skull“ was the only song I created myself. Pearl: You told me you enjoy being on the road. So tell me, how is this tour going? Andreas: It is awesome. We played some really great gigs. For me personally, Berlin was one of the best ones. I have friends there, so the atmosphere was different. Germany is always a blast, our music is very much appreciated here. Also it is always fantastic to play at home at our own festival, which is called Elav Stoner Open Air Festival. Pearl: That is something I hear from many italian bands. That their music is better appreciated here then in Italy. How is the scene for underground music there? Andrea: There are many venues, but the real problem with the underground scene is that it sounds just like the maisntream scene in Italy. Specially in the last ten years, there is no real difference, we don’t have an actual underground scene. We have this kind of weird italian indie pop, which is the same music you get in big mainstream festivals, only in Italian. Andrea: Yes, and all of them are trying to run away from Italy, musically. Everybody is trying to play Germany, Austria, The Netherlands, Switzerland… also the East of Europe. I mean, there is less money when playing there, but the scene is huge. Pearl: Please tell me more about the festival you organize in Bergamo. Max: Two years ago we started collaborating with the Elav brewery, the same one which brews our Humulus beers. We talked to Antonio, the owner, about organizing a stoner festival. We had the contacts, the location and even the beer already! He said „Let’s do it!“ Last year in July we had the first festival edition, with bands from all over the world. Karma To Burn, My Sleeping Karma, Monkey 3… It is a free entry festival, which makes the festival acessible. We have a lot of good beers and good food, and, of course, good music. This year the festival will happen in September, just before we hit the road again. Pearl: That sounds awesome. I really wish you a lot of succes with this project. I really love DIY festivals, since I think they are the future of the underground scene. Tell me… Do you already have plans for the near future of the band? Max: Exactly, haha! We want to do it with passion. Andrea: We have been listening to a lot of doom, so maybe the next album will be heavier. We don’t really know until we get your hands to it. Max: Let’s see how we evolve. Last time around, we actually wanted to do shorter songs, and they ended up being 10, 15 minutes long… So we will see, where the flow leads us. Pearl: Today will be my first time seeing you guys play live. Is there a tradition you have before every show? Andrea: We always make a toast on stage with our beer before start playing! Pearl: Do you plan to brew more sorts of beer? Or some other beverage with your name and recipe? Humulus: That is a surprise. Sorry! Pearl: Then we will wait. Thanks for this interview and thanks for being here. Thanks for the music and beer! Humulus: Thank you, Pearl! And thank you Rockblog.Bluesspot for picking us to play here this year. The FVF is an amazing festival, we can’t wait to rock this awesome stage. And maybe we will see some of you at our festival in Italy.